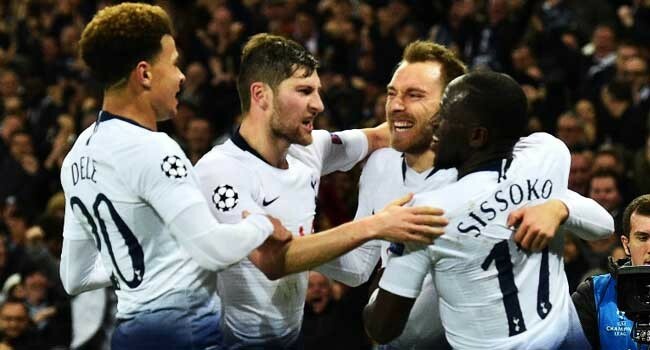 Christian Eriksen had to come on as a substitute to save Tottenham the blushes of a champions league group stage exit as the Denmark star’s late strike sealed a tense 1-0 win over Inter Milan on Wednesday. Mauricio Pochettino’s side were only minutes away from being eliminated at the group stage of the UEFA champions league for the second season in a row as they laboured to break down the inter defence at Wembley. But Eriksen, who was named as a substitute came to Tottenham’s rescue when he fired home to give them a lifeline. It was a dramatic game that Tottenham had to win to avoid bowing out at the group stage for the second time in three seasons. With Tottenham now level on points with third-placed Inter. They head to Barcelona to face the group leaders on December 11 knowing a win will get them a last 16 spot. It was a dramatic conclusion to an evening that started with a shock when Pochettino left Eriksen and Son Heung-Min on the bench despite their impressive performances in Saturday’s win against Chelsea. Faced with a do or die situation, Pochettino had claimed it was “massive motivation” for Tottenham to silence the critics who said they had blown their chance to make the last 16. His players seemed to have taken that message to heart as they dominated the first half. Harry Kane set the tone, barging through the Inter defence to force Samir Handanovic to push his shot onto a post. Lucas Moura appealed in vain for a penalty after being shoved over by Inter’s Matteo Politano. A muscular run from Kane ended with Dele Alli firing just over from the edge of the area. Extreme caution Moussa Sissoko led another rapid Tottenham raid featuring an exquisite Alli dummy, but Lucas Moura couldn’t finish off the move as he shot straight at Handanovic. Inter’s knowledge that a point would send them through meant they approached their first competitive match at Wembley with extreme caution. Content to defend deep for long periods, Inter’s safety-first game-plan was almost undone when Harry Winks curled a superb effort against the bar from 25 yards. Matias Vecino drilled wide as Inter finally launched an attack of note early in the second half. That was the signal for Inter to come out of their shell a little and Milan Skriniar was close to converting at the far post. Pochettino responded to the mounting sense of desperation by sending on Son for the last half an hour and introduced Eriksen 10 minutes later. It proved an inspired move as Eriksen turned the game in Tottenham’s favour. Hugo Lloris made a fine save to deny Ivan Perisic and moments later Tottenhwass ahead. Eriksen ensured Vertonghen wouldn’t live to rue his miss as the Denmark playmaker broke the deadlock in the 80th minute. At last unlocking the stubborn Inter defence, a sweeping move combination from Sissoko and Alli exchanging passes before Eriksen was teed up for a cool finish from 10 yards out. Pochettino’s relief was clear as he looked to the heavens and punched his fists into the air, but Tottenham still has one last hurdle to overcome in Barcelona before they can claim a round of 16 spot.